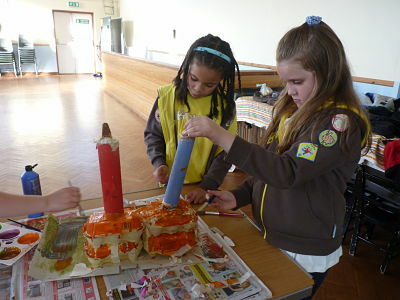 Activities 2013-2014 - 14th Birmingham Brownies (Sandon Road). It has been a year of challenges. Our first was the Disney Challenge where we built Disney Palaces, sang a song in French (Can you guess which one? ), dressed as our favourite character, and made a board game. We sold cakes for Christian Aid to support the church and raised over £55. Next was the Mexico Challenge to support Division Guiders who were taking a group on a trip. This challenge involved: planting sunflower seeds, making bookmarks with seeds, making a clay sombrero or cactus and eating quesadillas and fruit smoothies. 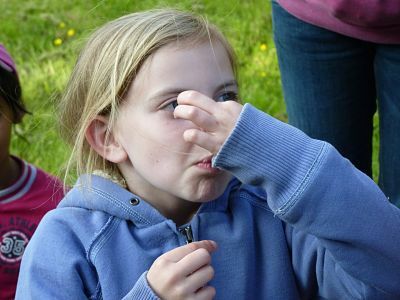 Our first Brownie Holidays, 7th – 9th June, had the theme of “I’m a Brownie, Get me out of here!” This involved cooking nettles and eating dried bugs! Thanks Jason! Most girls completed their Brownie Holiday Advanced badge. 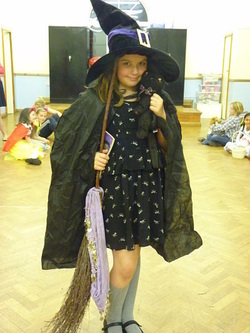 Our second holiday was with 172nd Brownies in November and had the theme of Top Secret, Spy Training. Both were well supported by Brownies and Leaders and enjoyed by all. 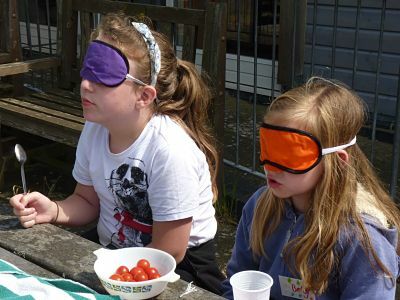 Blind food tasting - so trusting! We also took part in a Division sleepover at the Birmingham Thinktank Science Museum. It was a really fun evening, even if not much sleep was had! Why do they always switch on the lights when you’ve just dosed off? Book Lover Badge was completed by dressing as our favourite character or author, Mary Berry, sharing our favourite books learning how to care for a book and presenting a book review. The controversial New Promise came into use in September and so activities to help understand it lead up to our first enrolment using the new wording. Craft Activity at Milton Court were our first community link activity which I found a little daunting never mind the girls. Would the carpet and furniture survive paint-free? All went well and thanks go to Liz Wallis for arranging this evening for us. Brownie made Guy Fawkes, which sat at back of church, scared Jane when she came in to practice and joined in with the Sunday service. They were not much good at singing though! Talent Shows are my worst nightmare! This time, however, the girls really did show off their talent for playing musical instruments and singing to an appreciative audience of Rainbows and parents. Well done girls. In January we joined with the Boys and Girls Brigade and held a disco in aid of the church charity, The Alzheimer’s Society, when we raised over £70. The music was provided by a BB friend from Lyndon and was much appreciated. Hot dogs, cakes and juice provided much needed sustenance for the dancers. This year’s challenge is the Big Brownie Birthday Challenge, to celebrate our 100th birthday, with sections headed: You, Community and World – which have so far included First Aid, Chinese New Year and Thinking Day celebrations with Rainbows and it’s only just March! Thanks, as always, go to the church for their support, the leaders for giving so freely of their time and the Brownies for being ready for anything.